Let's be #plannercomadres she said. It'll be fun she said. She never said I would be broke buying so many stickers from my favorite Etsy shops here, here, and here. Let me rewind a bit. I am a feverish planner. I carry two at all times, keep another at work, and then email husband on a weekly basis of the current weeks plans. I cannot in good faith operate any other way and while for some it may make them loose their minds trying to keep up with lists, it is the only thing that keeps me sane. Recently my girlfriend/collegeroomate/bestie introduced me to the world of decorative planners. 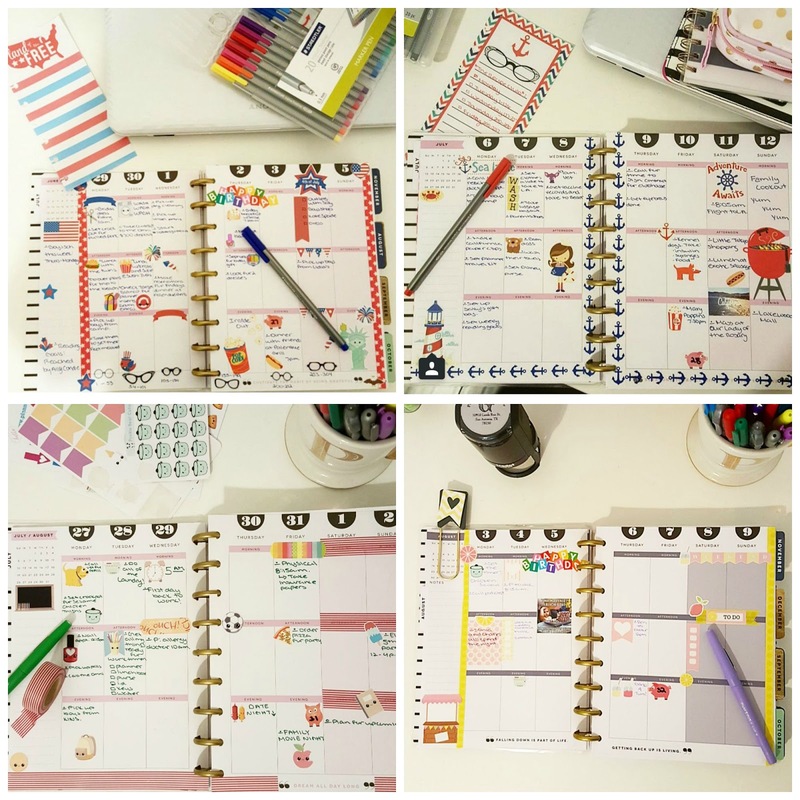 I had no idea there was a whole world of awesome planner ladies out there who are as obsessed as I am with planning, notebooks, stickers, and washi tape. Brought on by the Erin Condren planner craze, these women have found a way to mesh planning with scrapbooking. I have started to keep my planners and often refer back to them for that book I wanted to read and scribbled the name on the side of the margin in the month of May (yes, it has happened and yes I can recall random facts like that and yes I am creepy). But the thing is, aside from color coding my planners, they are just that and hold no memory keeping sake. During a craft shopping spree at Hobby Lobby, I came across Me and My Big Ideas (MAMBI) Create 365 The Happy Planner. This is an 18 month planner in its first version. It is a fraction of the price as some of the higher range options and has a similar layout in boxed setting as the Erin Condren. This is an arc based system which allows you to add and remove all kinds of inserts. MAMBI sells a variety of them but don't be afraid to make your own or download some of their free ones. I am having a blast creating my weekly spreads using stickers, Target Dollar Spot finds, and even creating my own stickers out of fun Pinterest images or my own Instagram pics (@lifeinmascara). One thing I also did was add in some blank sheets at the start of each month. My intention is to have a 'Brain Dump' at the start of the month and then have a 'How Are You Now' moment at the end of the month to reflect on what had been bothering me at the time. I like the convenience of having it all in one adorably gold polka dotted planner. So fancy! And so orderly! Hey what are good friends for. If we go broke and have to go file bankruptcy it was all in good fun. I mean we don't smoke and we don't drink a lot. We buy planner supplies, so sue us!! Cheers to a cute way of planning.